What’s the title of this blog? 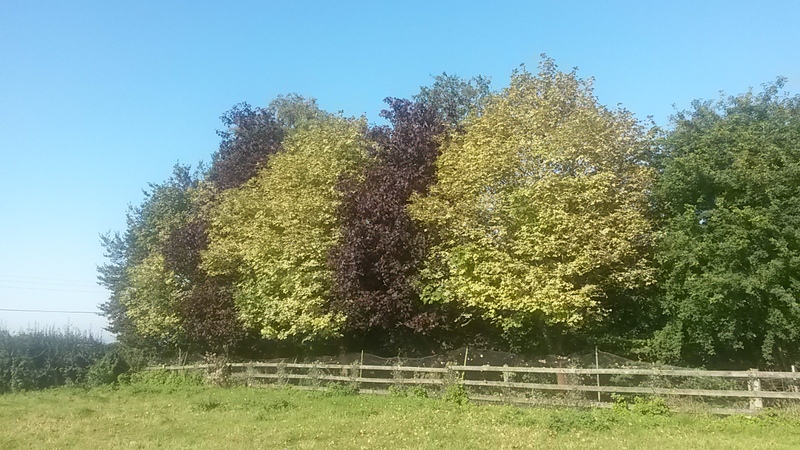 It’s getting towards autumn – in fact Mrs B observed to me last week that the day and night were at that point of equal length. “Aha – autumnal equinox” I said. She just sneered at my nice-boy schooling which got me a C at latin O-level to provide me with the ability to throw in some long words in short sentences. Add to the equinox a lunar eclipse which coincided with the harvest super moon and it is all beginning to feel just that bit chillier and darker around these parts. In gardening terms this is a time to plan, as the seed catalogues start to thump on the front door mat. But it also prompts an air of melancholy which puts me in a reflective mood. A constant topic of discussion with Mrs B is the reduction in the OM’s capabilities as he struggles with his breathlessness and decreasing mobility. But a lessening in mobility is something that guess I am coming to terms with as I ponder the fact that I will no longer be able to play competitive hockey or tennis again, as my knees and back have put paid to that. I feel old. But I’m not am I? I reassure myself that I can still dig the garden or plant up the Rudbeckia or Sweet Williams. And I also had my best round of golf the other day. So I tell myself that I am still active and reasonably fit…..but then I’m reminded that I am fit only within the parameters of someone who has truly hit middle age. So yes, if that is the sum total of my achievements then I guess I am getting old(er). Just check out the title of this blog for confirmation of where I am in life. 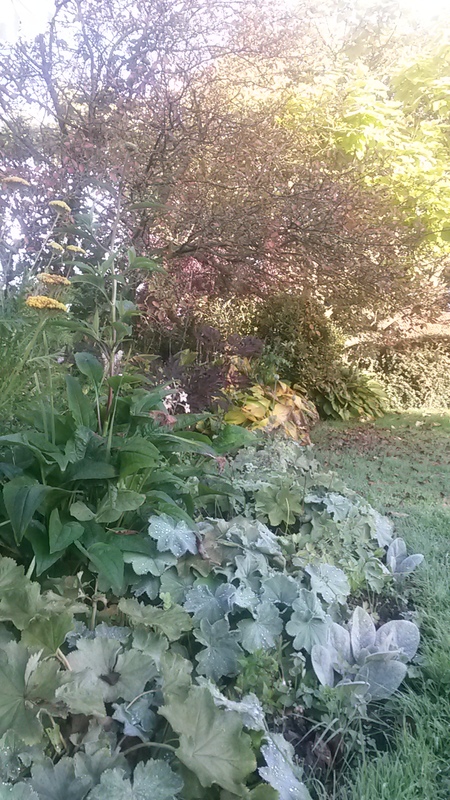 But the garden keeps me stimulated as we plan extensions to borders and think of new veg for the spring. 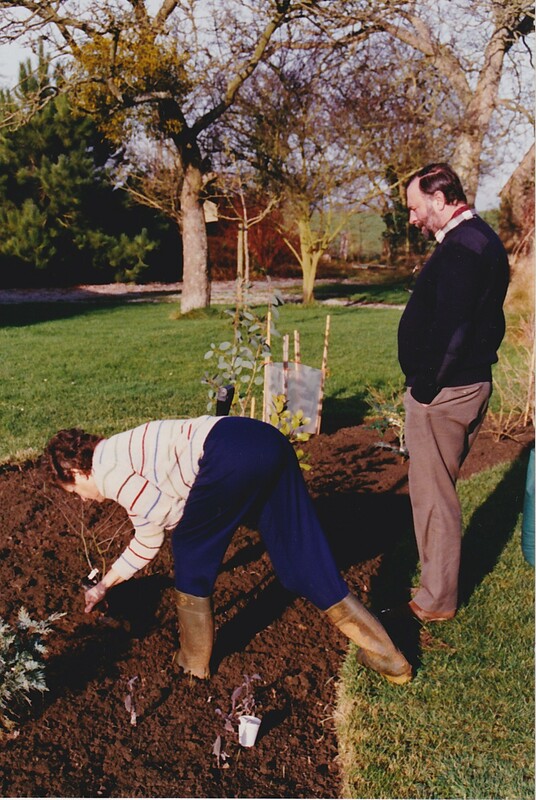 And in the spirit of reflection I happened upon some old photos of the boomerang bed when TOM and mum first planted it. The pics tell a story of how much the garden has matured in the intervening years, but also give some insight into the division of labour in the household in those days. We can see TOM standing tall and imperious as his life partner bends to do the planting. It might be an unfortunate moment, but I think it illustrates how this garden came to be. Other photos show the bed planted up for the first summer with begonias – Mrs B’s most loathed flower – and it brought back memories of how my parents would assiduously fill the borders with bedding plants every year. How times have changed: now the vogue is to emulate Piet Oudolf with drifts of perennials, an example of which we viewed the other day at Hauser and Wirth. I remember TOM as the manager from the time I helped mum to plant the five acers at the end of the garden. I must have been in my late teens. We put in the best part of a day’s hard labour digging the holes and planting the sizeable saplings in the rough field while the OM was at work. On surveying the work his initial reaction was to point out what we could have done better – which was not unusual. He told us they should have been three feet further to the left. The news was not received well: I suspect it was suggested that if he did not like their positioning, he was welcome to move them himself. They stayed where they were and thrived. He must have been about my age when the boomerang bed was planted, so it fills me with hope that the garden has come so far since then and continues to stimulate, challenge, frustrate but ultimately reward the work that goes into it, and will do so for many years. Hell, TOM is still around and able to gain some pleasure from the garden so I guess there is still plenty of life left in this Midlife Gardener yet. Who did all that work? 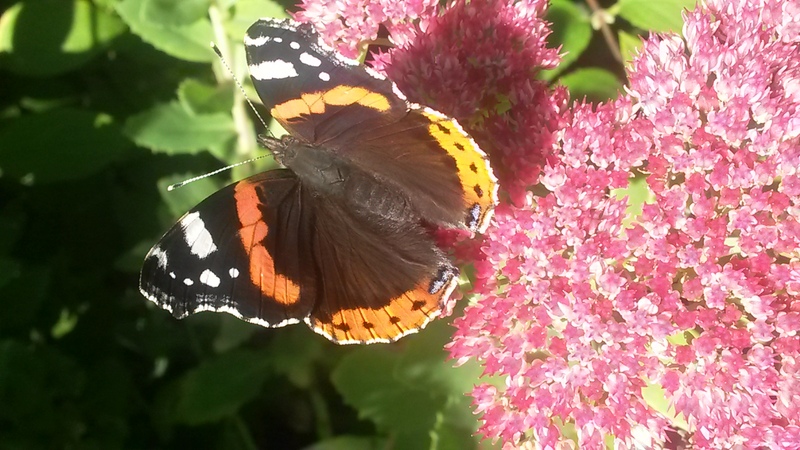 This entry was posted in Gardening Times and tagged Bedding plants, Begonia, Comma Butterfly, eclipse, equinox, Hauser and Wirth, Latin, Middle Age, roses, sedum, super moon. Bookmark the permalink.